I’m starting to see problems with the Maytag-built (includes Jenn Air) side-by-side refrigerators where the beer compartment gets warm, but the ice cream compartment stays very cold. (Home refrigerators have two compartments, the colder one for ice cream and the warmer one for beer. Many folks store frozen food in the ice cream compartment and fresh food in the beer compartment.) This differs from the typical defrost failure complaint which, in these fridges, is usually a bad Adaptive Defrost Control (ADC) board because 1) there’s no fuzzy ice built up on the back, inside wall of the freezer and 2) the freezer temp is good (around 0°F). Having established that the sealed system is intact (evidenced by the cold freezer) and that the defrost system is working, this means the problem is in the air distribution system. 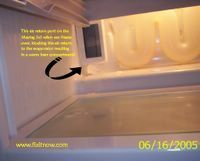 “Uh, say what?” Awwite, grab ‘hold of those two large lumps at the base of your spine and read this post for some background scoop on how the cold air is distributed around your fridge. The return air port in a Maytag side by side refrigerator located behind the crisper drawers in the beer compartment. Condensation can freeze in a sheet over this port blocking the return air flow, creating warm beer. This entry was posted in Refrigerator Repair on June 22, 2005 by Samurai Appliance Repair Man. I have a Maytag (inside the door it says its model no. RSD2400E, but the Maytag site says that’s an invalid number), and it has the exact symptoms you describe. Trouble is, the area behind the crisper drawer doesn’t look like your photo. Can you tell me where the heck the return air vent is and how I can recognize it? I have the same problem with my Maytag side by side MSD2556AE – I have defrosted the return air duct several times in the past 2 weeks, it keeps packing up with frost. What is the matter? I thought the door was not shut the 1st time but I’m sure the seals were tight now. Any suggestions? To discuss this problem, post it in the repair forum.